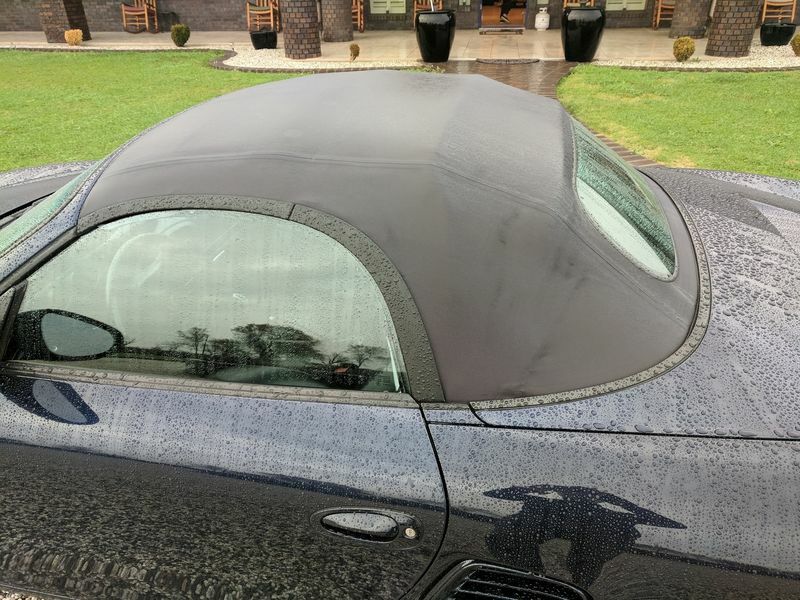 Question for the group: what should the convertible top look like after a day of rain? I carefully washed, brushed, and treated my top recently with RaggTop products. After applying three coats of the water repelling RaggTop treatment, water would bead up and roll off the top with zero absorbsion. In fact, the top appeared hyper aquaphobic; water would roll off comically fast! Now, a couple weeks and 500 miles later the car is seeing it's first FULL day off rain since I've owned the car (road trip to Sacramento for Christmas) and the water is not beading up on the canvas. Is this normal? I used the Raggtop product years ago with ok results. Water beaded up well after initial application but seemed to lose it’s effectiveness after a few months. Switched to the 303 Fabric Guard product and have been very happy with results. Easier application - you can apply with a paint brush which ensures even coverage and no overspray to deal with.